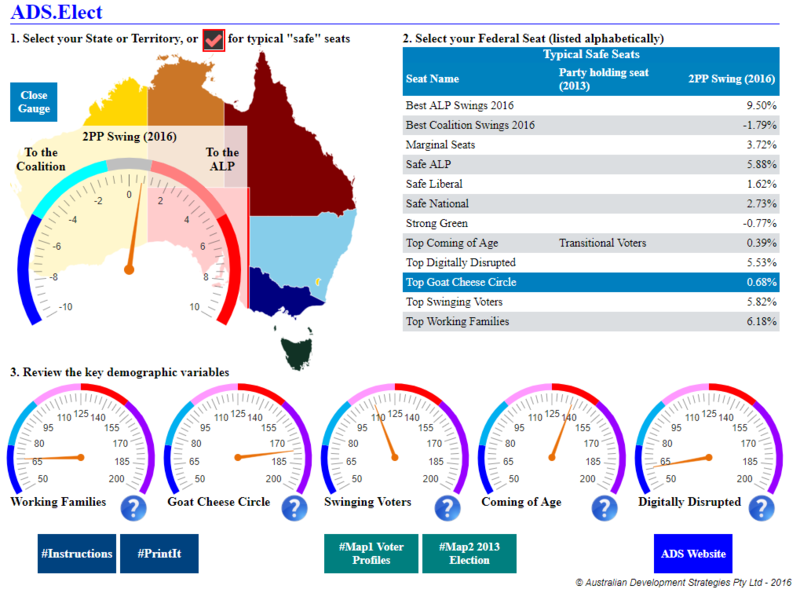 ADS, in conjunction with ESRI and Map Data Services, have produced a dashboard and linked interactive maps, to show you the key voting stereotypes for the 2016 Australian election and where you can find them. Click on the icon above for the Post Election ADS.Elect Dashboard and Maps. You will find all of the vote and swing stereotypes and related maps for every Australian electorate. Click on Post Election ADS.Elect Dashboard for full screen viewing. Click on Pre Election ADS.Elect Dashboard for full screen viewing. A week after the election on January 31, it is still unclear which of the two major parties will form a Government. The most likely outcome is a minority Labor Government supported by Independent Peter Wellington. Labor candidates won an estimated 50.9 percent of the two party preferred (2PP) vote, but Labor appears likely to win only 44 out of the 89 seats. On the same state boundaries in 2009, Labor Premier Anna Bligh won a comfortable majority of 51 seats with 50 percent of the 2PP vote. This failure in 2015 to translate a majority of the 2PP Labor vote into a majority of seats came about because Labor failed to win middle class and professional voters in aspirational marginal seats on the Gold Coast and in Brisbane. The major driver of the swing against the LNP appears to have been the current high net dissatisfaction levels of LNP Leader Campbell Newman and Federal Coalition Leader Tony Abbott. Campbell Newman’s personal vote in his own seat of Ashgrove was minus 5.5 percent and this is consistent with the impact of a net dissatisfaction rating of minus 23 percent, which was recorded by Newspoll on January 29. Read Full Report – Qld State Election Report 2015. Qld State Performance, Qld State Trends, Aust. State Predictions and Federal Seat Predictions. 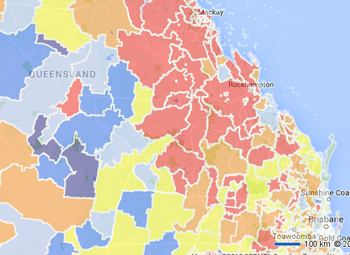 Map showing predicted alp 2pp vote by neighbourhood (sa1) based on the Qld State Election. 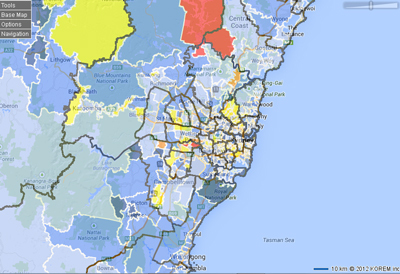 The map shows the Predicted ALP 2PP Vote by SA1 based on the QLD state election with the Federal electorates overlaid. 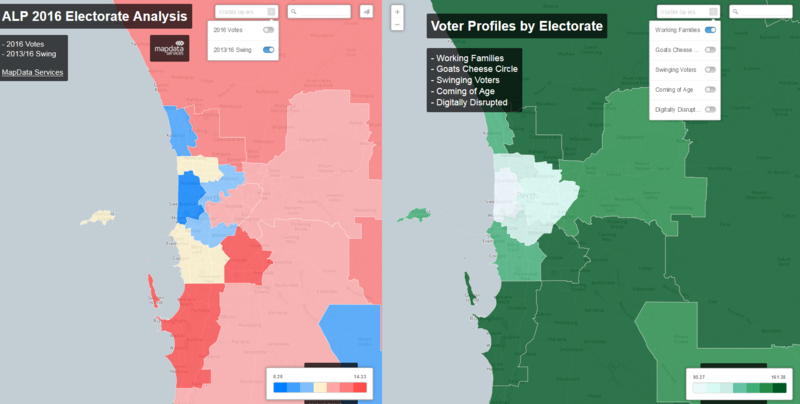 You can search for an electorate and get the results for the electorate. There is also a separate layer available showing the 2pp swing to the ALP in QLD state electorates as per the original map. The strongest swings against the ALP in 2012 were from Labor’s own 2009 Labor voters. This swing correlation of minus 0.67 from Labor’s Queensland state 2009 support base was even bigger than the swing correlation of minus 0.57 against the NSW ALP from its support base last year. In other words, the biggest swings against Labor were in its safest seats. On Election Day, March 24, Labor lost 15.6 percent of its 2009 primary vote, taking it from 42.3 percent to 26.8 percent. This is more than one in three former state Labor voters. Of the 89 seats contested by Labor, the Labor Party did not win more than 50 percent of the primary vote in any seat. The highest primary vote was 47.4 percent in Woodridge, one of the eight seats retained by Labor. The first range is up to 3.5% which was the national average swing, the second range is 3.5% to 7% and the highest swings are shown as 7% or more.